Hug Point is a beautiful beach on the Oregon Coast with a bit of interesting history. Because of it’s name, it has become a popular, romantic spot for couples to exchange wedding vows. However, it is called Hug Point for very different reasons. When the tide is low enough one can see, and walk on, the old highway. Yes, you read that right. 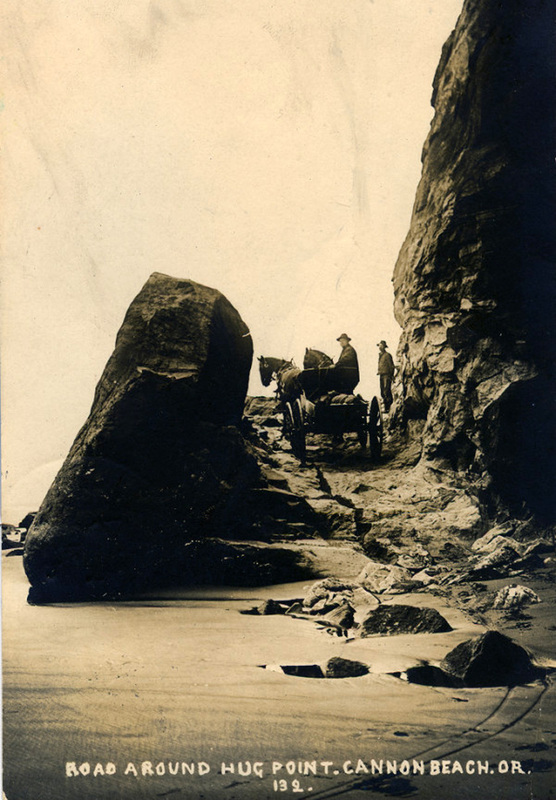 Before highway 101, the coastal highway was the beach and at this particular section, travelers had to wait until a low tide to “hug” the cliff to get around it. Unfortunately low tide didn’t guarantee a stagecoach (or car later on) from getting stuck. At some point someone decided (it is unknown who it was) to blast into the cliff to create a one-lane section of road, making it easier to vehicles to travel around the cliff. It’s fascinating to look at old photos of this place – it really hasn’t changed at all since the olden days! There is a waterfall here. There is a cave here, too. These photos were made with a TerraPin Bijou. Film used was Ektar 100 and Portra 400. Here is my latest post up on Pinhole Obscura about a beach on the Oregon Coast with an interesting history. Beautiful photos- I particularly like the waterfall! I visited Hug Point briefly in March just before sunset and had no idea there was the old highway hidden there.